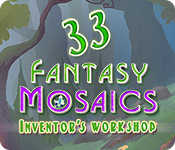 Fantasy Mosaics 33: Inventor's Workshop is rated 4.3 out of 5 by 9. Rated 5 out of 5 by mistypie from Book puzzle impossible to win Latest in this long series is up to its usual standard wuth the addition of some mini puzzles in the workshop, the puzzles I have played are good however the book puzzle is impossible to win if you go first which you have to do as you dont have a choice, shame but the rest of the game is great as usual. Rated 5 out of 5 by memphis836 from A Well Done Game Our Penguins are back and are having fun with new colors and new puzzles. This mosaic series is the best one and I always look forward to the new games. They never disappoint and if you are new to Mosaic puzzles, this is the game to get. Well done! Rated 5 out of 5 by ColoNative from Continuing Line of Excellence I've always enjoyed the Fantasy Mosaics and this one fits in with the first 32. 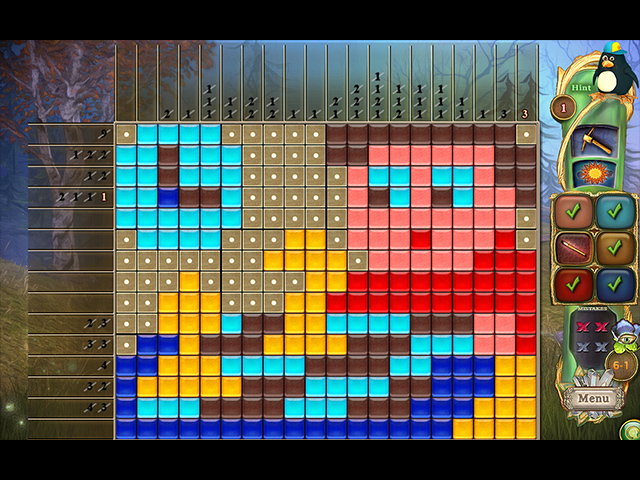 The mosaics are logical and it's added fun factor (puzzle) that I've encountered so far is an added bonus. The music is great as is the visual. The ability to change the level of the challenge is still awesome. I've always liked the ability to reset the puzzle just by clicking on the reset button rather than going back to the menu and doing a restart. Rated 5 out of 5 by biscuitsmama from I CAN NEVER SEEM TO GET ENOUGH OF THE PENGUIN FAMILY I have a hard time believing that this is Fantasy Mosaics 33. I know, thankfully, that we never seem to have to wait too long for the next game in the penguin saga but it is hard to imagine that game 33 is here already. There is another mosaics game that I love now as well, but I still feel a certain fondness and loyalty to Fantasy Mosaics. When I began playing FM 33 this morning I was surprised at how it began with a bit more challenge than is usually the case and I was happy to see it. I also love the seemingly new mechanics of the way we enter the next set of puzzles. For all of you who love Fantasy Mosaics I am sure you will be happy with this game and it will most likely be an instant buy for you. 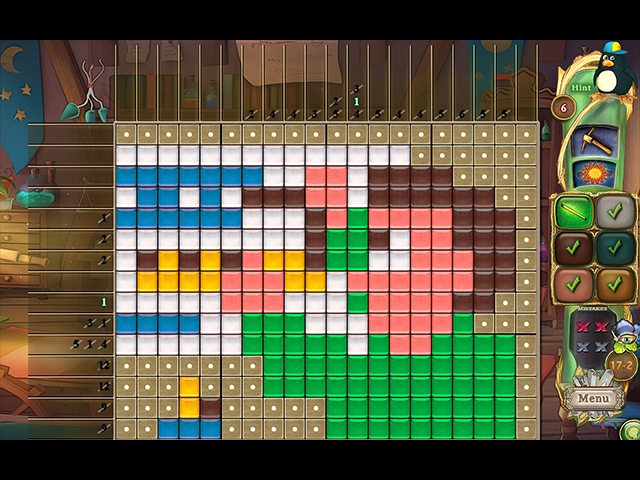 After all we lovers of mosaic puzzle games can never seem to get enough of them. The great thing is that we can play a few boards when time allows and then pick it up and begin again. The only thing I would love to see in future games is that if we must stop playing at some point, we have the option to save the current board so that we could come back and pick up where we left off rather than having to begin again. All in all, Fantasy Mosaics and the penguins are still a long-time favorite game with me. As always, please try the demo to see if this is a game you will enjoy. Happy gaming! Rated 5 out of 5 by arnold1049 from FANTASY MOSAICS 33 CONTAINS GREAT SURPRISES I never miss purchasing the Fantasy Mosaics games; I purchase them as soon as they're released; I never waste time playing the free demo. I was expecting pretty much the same gameplay as all the other games in this series, but I was just astounded at the changes made to previous games. The first thing I noticed was the much improved graphics. They are much brighter and the scenes are more detailed and colorful. So relaxing on the eyes and more interesting to explore. But the biggest surprises were the additional mini-games within the main game. In addition, there are more scenes to complete instead of just the one garden, etc. I have played two sets of 6 puzzles and so far there are 2 rooms in the house to populate with items won by playing the main game. Moving into a different room also set off another puzzle. This puzzle was to remove sets of 1 to 3 books off a shelf without removing the last one. I tried twice and was unable to complete it correctly. Sure adds to the challenge of the main game. This game has all the other great mosaics as the previous games. 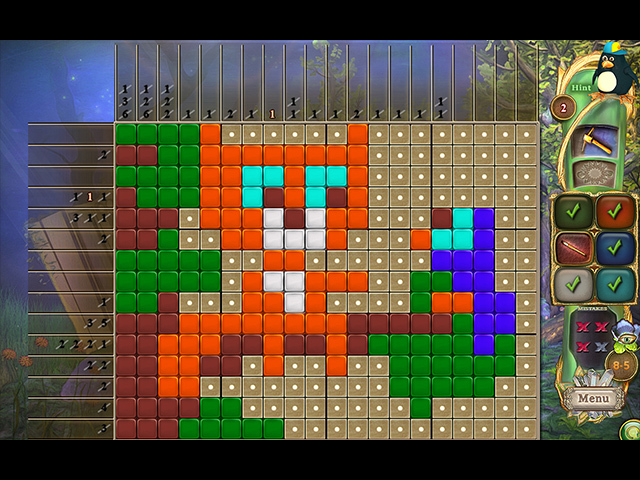 There is a choice of difficulty, several choices of tiles to use, and many-colored scenes to solve. But this game goes so much farther than any of the other games in this series. It is much more interesting and challenging, I didn't want to stop playing. How wonderful to find one of my favorite series expand into new areas. Way to go! Don't miss this game even if you have or haven't played the others in the series. Rated 3 out of 5 by LogieBaby from will this series ever end or better yet change?? Lots of players relish each new FM grid game. I'm not one of them simply because there are too many. Lots of grids are repetitious so whenever I get an urge to visit it's easier and cheaper to redownload a previously purchased game. 3 stars for this version since it is much easier than some of its predecessors. During the one hour trial I completed 21 grids and I never use hints. A couple years ago a different developer devised a grid game that had 3 different shapes which provided a greater challenge than these FM games. The problem with the 3 shape game was a glitch which prevented the completion of some grids and a patch was never issued. Perhaps the powers that be at Match Gems can put on thinking caps and come up with a new twist instead of churning out the same game every couple of months.